As of this writing, a fairly sizeable nor’easter is heading in our direction and ahead of it’s arrival, forecasts are floating around discussing various possibilities and the uncertainties associated with each one. In this spirit, I figured I’d take this month’s Beyond the Forecast column to delve into all the factors that make weather forecasting an inexact and often frustrating science. 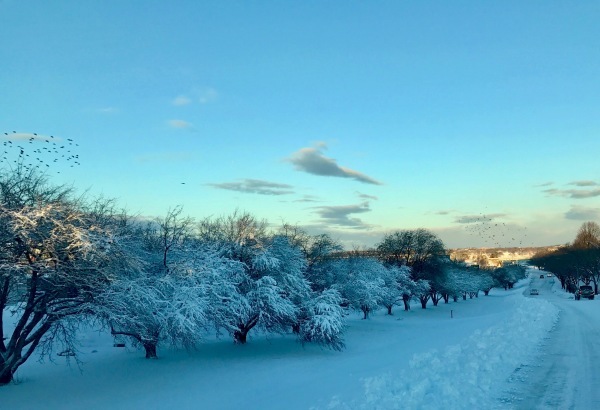 This column will focus on Winter time forecast challenges in imprecisions and a future installment will likely cover warm season challenges. Why are snowfall forecasts only issued one or two days before a storm and why are they given in ranges as opposed to just one number? Why can’t we say if precipitation will fall as rain, snow, sleet, freezing rain, or a mix of everything more than a day or so out? Sometimes those are easy calls but most of the time, we just don’t know until the event gets closer. The answer to all of this resides in chaos theory and how we attempt to understand the atmosphere around us. Weather forecasting is based off of very complex models that take the condition of the atmosphere now and make forecasts based off of what is happening now. This would be like looking up on a hot summer’s day, seeing a thundercloud in the distance, and forecasting that you will see a thunderstorm soon, just on a much grander scale. This is where chaos theory comes in. Chaos theory states that slight errors in the modeling of the initial state of the atmosphere will be amplified dramatically as you go through time. In simpler terms, if we misjudge the position of a storm by one mile now, you will miss its position by 15 miles tomorrow, 50 miles the next day, 100 miles the next day, and so on. Those numbers aren’t exact but they illustrate the principle. To have a perfect weather forecast, you need to know exactly what every air molecule is behaving at any one time through the entire atmosphere. This is far beyond our current observational capabilities. Imagine trying to account for the air pushed around by every car, person, animal, plane, etc. Air flowing across the surface of the earth encounters countless obstacles that would need to be precisely accounted for: trees, rocks, mountains, buildings, etc. All of this would need to be done at a molecular level to get a perfect weather forecast because any slight error in the initial conditions of a system will be magnified over time. Even if you were able to figure out a way to measure exactly what every air molecule was doing at a given time, you would need to come up with some sort of way of predicting what each molecule will do in the future. This would require figuring out which molecules would warm, which would cool, which would rise, and which would fall. Every single movement of every single molecule would need to be accurately predicted. That is unsurprisingly well outside the grasp of our current understanding of atmospheric dynamics. Finally, assume that we could observe and measure every air molecule and we had some set of rules (equations) to figure out how each molecule would behave. The next issue would be that we’d need to solve all those equations for each of the hundreds (thousands?) of trillions of molecules that compose our atmosphere. Computers can solve equations really fast but a perfect forecast wouldn’t be ready until several days after it started meaning that we could have a perfect forecast for Monday but it wouldn’t be ready until Thursday. Because we can’t observe every single air molecule, the initial conditions of our models are flawed. Chaos theory dictates that these flaws, however slight, will magnify exponentially over time. Even if we were able to observe every air molecule, our current set of equations that explain their movements are flawed and these flaws, like those in observations, will be magnified over time. Even if we had perfect observation and perfect equations, our computers are currently just too slow to crunch all the numbers in time for the perfect forecast to be useable. That’s why snowfall forecasts are given in ranges rather than solid numbers, why we can’t say for sure if it’s going to rain, snow, sleet, freezing rain, or do a mix of everything, and it’s why we can’t tell you if it’s going to rain on your wedding/party/event/picnic at 4.30 in the afternoon on the 14th of June next year. See the chart on the next page from the National Weather Service? 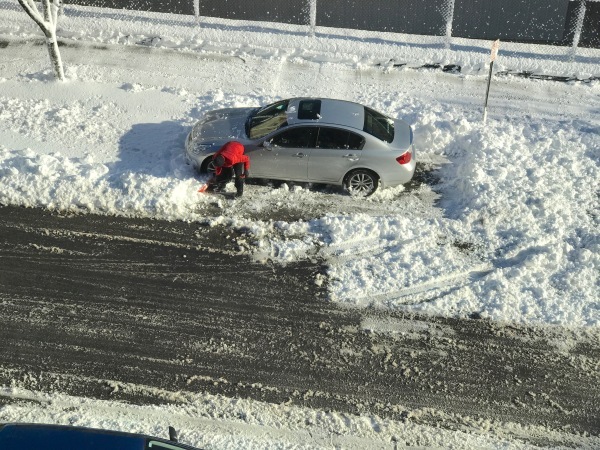 My editor added it a few days after I submitted this column to illustrate just how those snowfall “ranges” work and to show just how much difference even a mile or two can make. 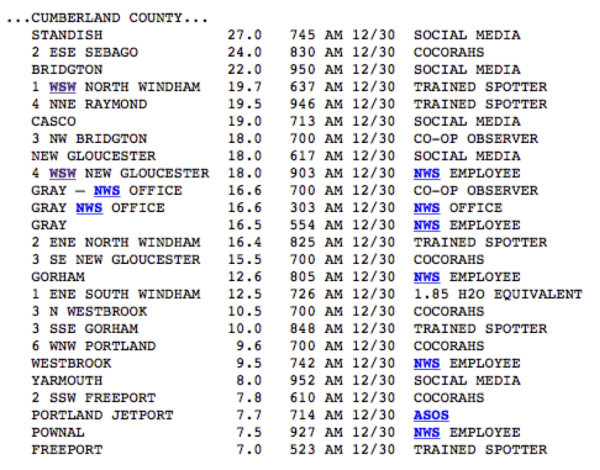 It’s the Cumberland County official snowfall totals from that 29th & 30th December nor’easter I referred to at the beginning of this column and it shows just how much things can vary. The photos on these pages are from that same storm and graphically illustrate how the changing forecast of snow, rain, thunderstorms (though we did get thundersnow) and heavy, wet snow varied throughout the day as meteorologists struggled to keep up with the changing dynamics of just that single late December storm. Enjoy the snow and remember chaos theory the next time you curse your favourite meteorologist for their indecision! Bombogenesis: This term describes explosive intensification of a low pressure system. Bombogenesis occurs when a storm’s central pressure deepens at a rate of 1mb/hr for 24 straight hours. When storms offshore undergo bombogenesis, look out for wild weather including heavy snow, rain, and strong winds, just like we saw in Maine right before the new year! Deformation Zone/Band: A deformation band is a band of heavy snow that can be found underneath an upper level deformation zone. In technical terms, the deformation zone of a storm system marks the western edge of the cyclonically curved warm conveyor belt. In non-technical terms, it’s where the warm moist air runs most explosively into deep cold air. Deformation bands can produce snowfall rates of 2-4” per hour and are often accompanied by wind gusts over 40 m.p.h. leading to blizzard conditions. How long the deformation zone lingers over a given area will determine how much snowfall that area receives.